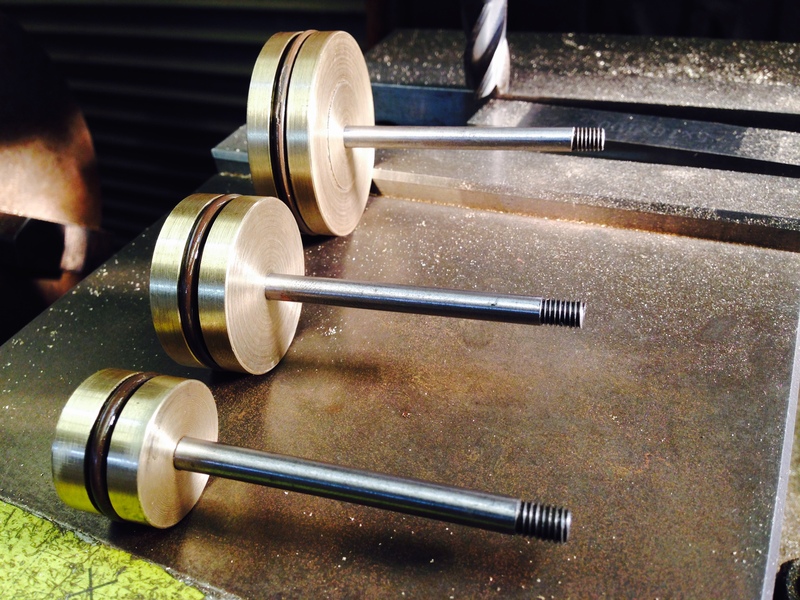 Piston rods for triple, and some engraving. A case in point for me is the trials and errors of engraving. 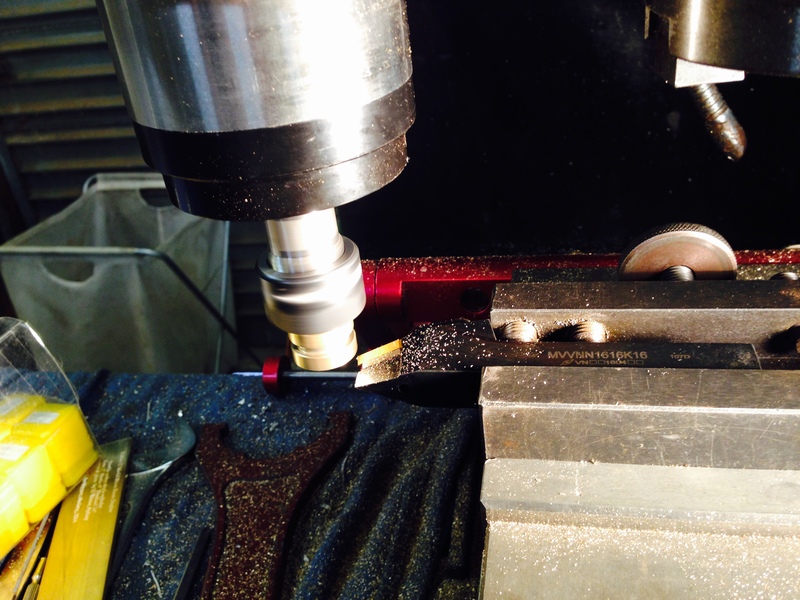 In previous posts I outlined the steps in setting up the engraving spindle on my CNC mill, and the mechanical issues now seem to be fixed. But getting lettering which is crisp, clear and attractive, in brass is a bit more complicated than, say, using a computer printer. Issues: Selection of cutter (angle of point, flat area or not),Spindle speed, feed rate, depth of cut, coolant or not, and selection of font are all variables to consider, and try out. Also whether the letters are raised or excavated. 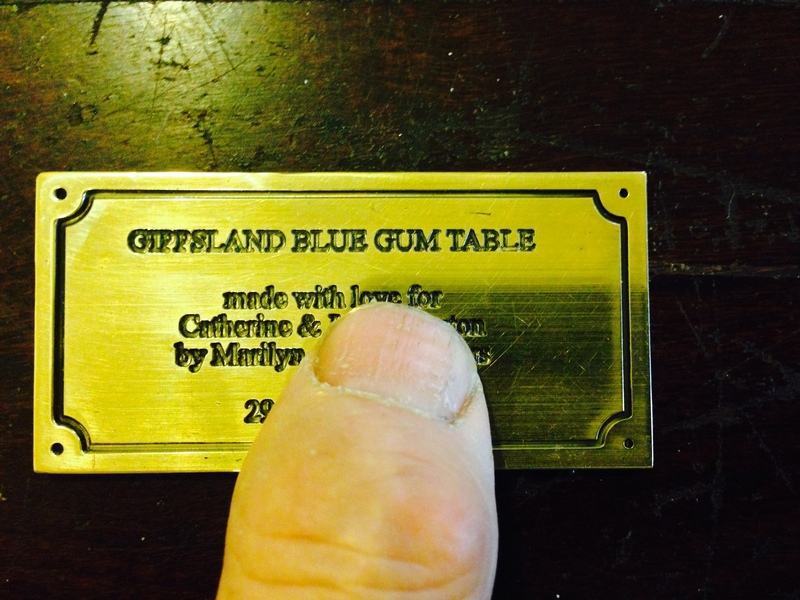 Each brass plate (65 x 32mm) takes 15-30 minutes to engrave, plus set up time. So I have spent many hours in the last week trying various combinations and permutations. Here are some pics of early results. Finger for scale, and for privacy of the recipient. The quality is OK, but not quite as sharp as I would like. Lettering is 0.75mm deep. Perhaps a little too deep. 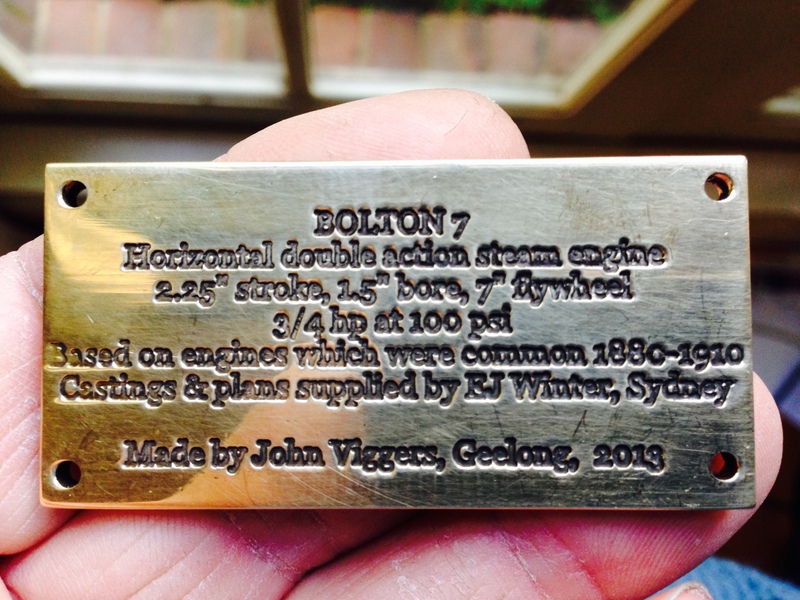 Label for a steam engine. It is crowded and fussy, but I will probably use it until I get around to making a better one. Some progress on the triple expansion steam engine, but not much to show visually. The pistons and piston rods have been made and fitted. The piston rods screw into the pistons, and then have a lock nut on top. The lock nut will be loctited at the final assembly. I had an issue with the piston rods not being exactly concentric with the pistons, probably due to inaccuracy of my lathe chuck. So I skimmed the piston surface while holding the piston rod in the most accurate chuck in my workshop, which is the engraving spindle. See the photo. The pistons, piston rods and viton rings. Turning pistons on a vertical mill. It shows the high pressure piston (the smallest one) held in the collet chuck of the engraving head, being skimmed with a lathe tool which is held in the milling vise. It worked very well indeed! Looks like an interesting case of turning on the milling machine. Yes. In this instance the milling machine can be termed a vertical lathe. Which raises the question, what defines a lathe? Is it the fact that the work revolves? Does it have to be horizontal? Semantics.